Peace talks don't seem to be helping in the Middle East, so maybe Nintendo can make a difference instead. Acclaimed author Salman Rushdie thinks he knows exactly what will solve the issues plaguing the Middle East these days. In a recent interview with Big Think, Rushdie said that the answer just might be videogames. Rushdie heralded the videogame as a medium that has the potential to take storytelling to a place that books can't. Through watching his son play Red Dead Redemption, he realized that the player of a game has a "greater agency to explore and inhabit the world" than the reader of a book. Videogames tell stories "sideways" and Rushdie said this interests him, comparing the method to short story The Garden of Forking Paths where an author attempted to tell every variation on his story possible. Ultimately, this becomes impossible in a book, but in a game Rushdie believes there are "millions of possibilities offered at the same level of authority." At the same time, Rushdie said he worries about a "dumbing down factor" of the storytelling in videogames, meaning that it may harm the human relationship with the art of the story. This is obviously something important to him as an author, and to humans which are sometimes called the "storytelling animal." Still, Rushdie sees a huge amount of value in videogames, and he even says they could solve a number of conflicts in the Middle East. When asked about Islamic terrorism, a problem he became close to after a fatwa was issued against him for publishing The Satanic Verses in 1988, Rushdie offered a lengthy, detailed explanation of what can be done to prevent the "colossal battle" that is taking place within Islam in areas like Iran and Iraq. However, he ultimately says: "I often think that the best way to liberate Iran is to drop Nintendo consoles from the air. And Big Macs." He's got a good point. As far as I know, his idea has never been attempted before, so why not give it a shot? 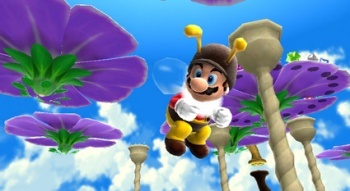 Who could fight a war after seeing Mario in a bee suit?